Are you looking for some inspiration for your wedding photography portfolio? Looking at the work of other wedding photographers can give you some great ideas for your own work. 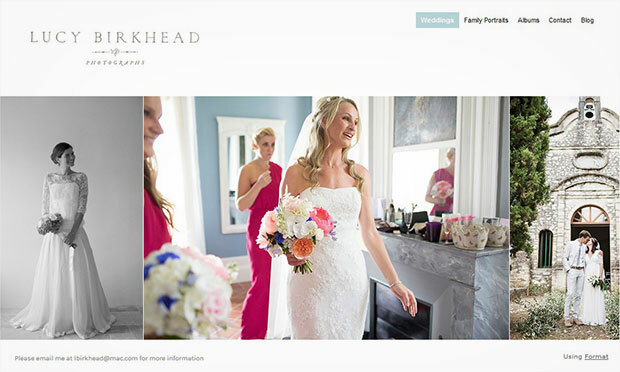 In this article, we will share 11 best wedding photography portfolios for inspiration. Matthew Ree is an expert photographer specializing in lifestyle portraits and weddings. His work has been featured in magazines and media all over the world, including The Knot, New York Magazine and others. 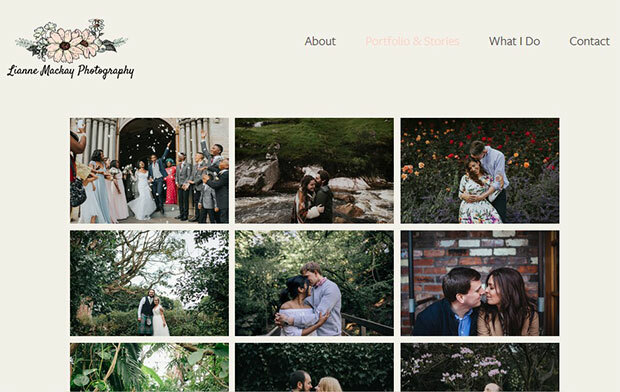 His website features a massive portfolio of his wedding photos, displayed in a simple carousel slider. Matthew is a master at color, lighting, and posing. Lucy Birkhead is a UK based wedding photographer. She’s an amazing story-teller, and writes captivating blog posts that describe the stories behind her wedding photos. Lucy’s portfolio includes an image slider with some of her featured shots. She loves to capture candid moments, which makes her work unique. 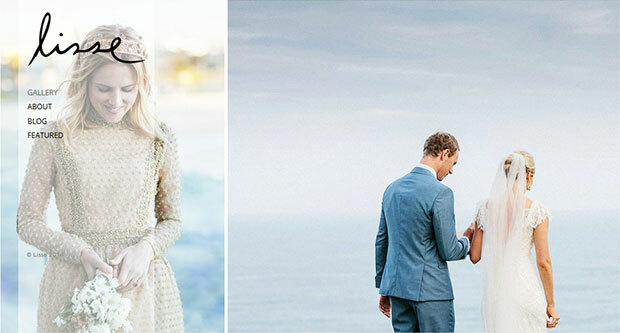 Lisse Wedding Photography is a masterpiece by photographer Elise Hassey, based in Bondi Beach, Sydney, Australia. Elise’s wedding photos have a dramatic and organic style. Her photos are also an outstanding example of the use of black and white. You can find her work in top Australian magazines like Vogue Brides, Bazaar Brides, Bride to Be, and more. Elise’s website is simple and sleek with a moving slider that displays some of her best shots. Kate Weinstein’s portfolio displays her beautiful photography in an attractive carousel slider. Once you click in to her wedding photos, she uses a captioned photo gallery to display each of her wedding albums. James Anderson is a wedding photographer who really brings out the beauty in small, ordinary moments. His clients love his laid back, easy-going attitude towards wedding photography. When the couple really enjoys working with you, you’ll have their endorsement for a lifetime. James believes in this approach, and develops a great rapport with his clients. 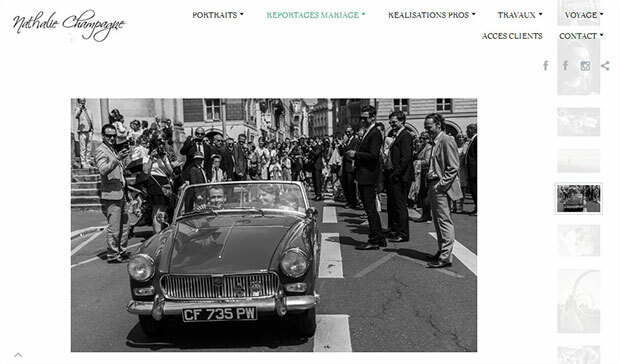 Nathalie Champagne is a French photographer with an impressive website with a thumbnail photo gallery on the right side and large photos in the center of the front page. You will find that she has a happy personality, which shows through lots of laughter and joy in her photos. The Jar Photography is the website of Juan and Angie who are wedding photographers in Calgary. This duo focuses on the unique personalities of their clients to capture the intense beauty of the couple. Their portfolio features a bold hero image up top with an image gallery beneath that gives you a sneak peek in to their password protected photo albums. These albums can only be viewed if you have a client log in. Kelly Paulson is the photographer behind Wild Whim Photography. Her use of color make her photos really stand out. Her portfolio is very simple, with a masonry layout which uses lightboxes to view each photo up close. She also shares about her wedding photography workshops on her website. 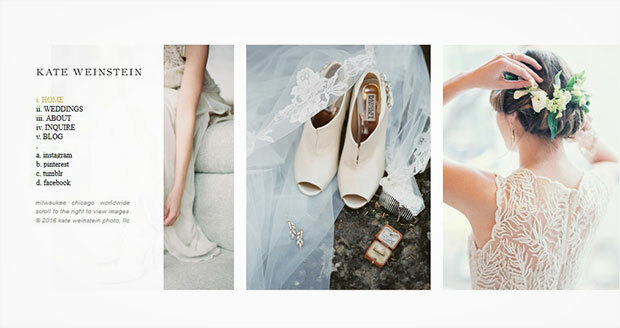 Lianne Mackay is a wedding photographer based in Edinburgh. Her photos are a great inspiration to many new photographers. 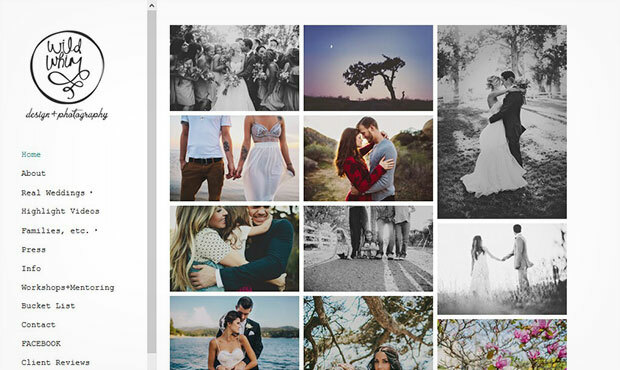 She displays her wedding photos with large thumbnails on the frontpage of her portfolio. Once you click in to a photo, you’ll go to the blog post for that shot where Lianne has recorded the backstory for that shoot. To create an image gallery just like this for your blog posts, you may want to check out our guide on how to create a featured content gallery. 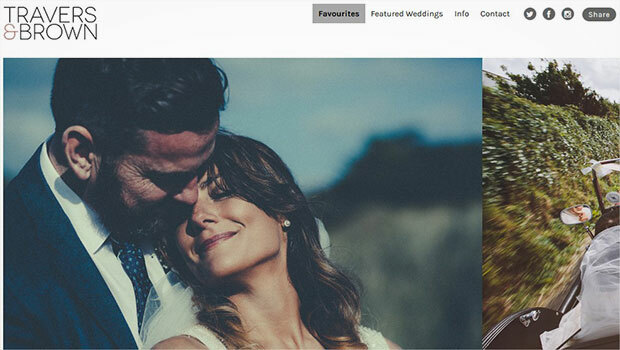 Travers & Brown is a UK based wedding photography venture owned by Andrew Brown. Andrew has a lot of experience shooting weddings, and it really shows in the way he poses his couples. His portfolio features a large image slider. To create a similar slider for your WordPress portfolio, you may want to check out the Soliloquy Image Slider plugin. 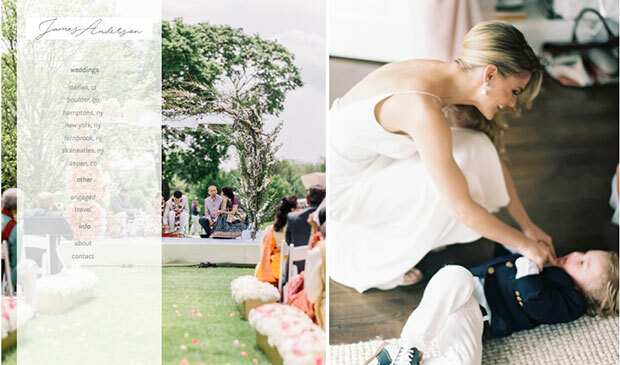 Emma Watson has another amazing wedding photography portfolio that you should check out. You will find her photo albums on the front page of her website, organized by the couple’s name. To create a portfolio like Emma’s, check out our guide on how to create a photo album in WordPress. That’s it! We hope this article has helped you to find the 11 best wedding photography portfolios for inspiration. Before you build your portfolio, you’ll need to create your own photography website. To learn how, check out our comprehensive, step-by-step guide on how to create a photography website in WordPress. Hi, I’m Jay. I’m a Sydney based photographer specializing in candid wedding photography. My style is also called a photojournalistic or documentary wedding photography.